I received my Glen L plans Monday along with the instructions, fasteners, carbon paper and the book on plywood boat building. I layed out the drawings and read all the instructions all while attempting to digest the plans. I'm half way through the book and after dinner tonight I headed out to the shop for 2 hours to begin my zip build. As a kid I was my fathers carpenter apprentice who has now grown to be a self taught amateur woodworker. Im certainly no expert and I often muddle through the construction and joinery work of furniture construction but when I'm done I'm generally pleased with the outcome. I posted in the introductions forum how I was in a rut with my woodworking, in need of inspiration. This spring my wife and I purchased a new 2014 Yamaha FX Cruiser SVHO to enjoy at our small family cottage on one of the finger lakes in upstate NY. We fell in love with the water all over again and have put 60 hours on her already. I grew up in a small town on the Erie Canal. I have spent many a day in and on Lake Ontario and I virtually grew up under my grandparents watchful eye at our family cottage living in the water. It has always been with me yet I failed to see how much joy the water has always brought me. Probably just took it all for granted until now. Well inspiration found me as I began to notice the boating world. One thing led to another until I stumbled upon the hobby of boat building. A quick Google search later brought me to glen L and my next project was born. I wanted to build something big, a cruiser or blue water sail boat. I wanted to go all in and immerse my self in the project. Fortunately some sage advice from my wife along with advice from this forum gave me some perspective. The zip will allow me to work out the bugs, as it were, before I build something for extended cruising. 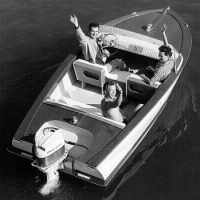 My vision for the zip is a bright finish reminiscent of the classic wooden runabouts from Chris craft. Dripping with mahogany, grout lines and plenty of chrome. The art of any project in wood is the finish. Silky smoothness and a flawless reflective finish. Combining that goal with a durable marine finish will certainly be a challenge. Tonight I began sorting white oak for the frame pieces. I'm fortunate to have plenty of stock to work with along with the machinery, tools and clamps necessary for the job. I'll still need to purchase the mahogany and marine plywood but again I'm fortunate to have easy access to those materials from a speciality lumber supplier 20 minutes away. I'm excited to begin and I look forward to keeping this thread updated with my progress. I'll do my best to contribute to the forums with any knowledge I may have on tools, machinery and all things woodworking related. Additionally I already wish to thank many of the members here who gave me inspiration and answered so many of my questions I had without having to even ask. Here's a few pic's from my shop tonight so you'll understand where my zip will be born. I'm a grizzly fan as you can see from all the green. Welcome to the forum!! The Zip is a great first boat and you will learn many things and develop the skills and knowledge needed to move on to a bigger project. The Zip was my first project and I learned what it is like to build a boat and develop skills and techniques. Thank you for keeping us updated with your build. The title to your thread makes me smile! Your passion is awesome and you have a great shop to work in--we look forward to seeing your progress. Wow, with a shop like that Id always have a boat project going, one after the other. Great choice of first boat. Not sure if you plan to track it but Id be really interested in the hours it takes you to reach the milestone points of the build with a shop like that and if its significantly quicker than building with a minimal garage shop. My guess is you could cut your time down by maybe 20 percent. Regardless, this will Im sure be a fun build to watch, enjoy! The Zip seems to be a perfect fit for a garage or shop build for many boat builders--primarily because it fits in those spaces and still feels like a 'boat' and not dinghy on the water. With your woodworking background and advanced shop set up, we will be expecting a fine Zip indeed! I'm looking forward to following your progress. My Zip is likely the antithesis of what you are going for in your own effort, but hopefully, I will be able to offer a tip or two along the way as many here will be happy to do. I really enjoyed reading your post as it takes me back to my childhood. My dad was transferred to Rochester with the Xerox Corp. when I was in the 3rd grade. We moved to Pittsford and boated on Canandaigua and Kueka lakes along with annual trips to Clayton on the St. Lawrence seaway. Good times... Good luck with your zip! JasonG wrote: I really enjoyed reading your post as it takes me back to my childhood. My dad was transferred to Rochester with the Xerox Corp. when I was in the 3rd grade. We moved to Pittsford and boated on Canandaigua and Kueka lakes along with annual trips to Clayton on the St. Lawrence seaway. Good times... Good luck with your zip! Our cottage is on Canandaigua Lake. The Internet makes the world very small. Most of my woodworking is mission style stuff with lots of straight lines. These boats have very few straight lines so I'm feeling challenged. Very fun so far! I'm going slower than I thought I would but that's ok I'm having fun. At around 13 hours in and I have 2 frames built. Taking my time trying to ensure equal angles on the insides of the frames. Sometimes that's difficult with no straight lines to reference off of. When in doubt I'm going for symmetry with corresponding parts. The only thing I did a little different was incorporate pocket hole screws into the frames. I did this simply to aid in alignment for the epoxy glue up. It worked great and I would definitely use it again for future projects. While they do provide considerable strength to the joint I'm not relying on it. I will fill the holes with epoxy to waterproof them and then apply the double gussets. I'm looking at it as the belt, suspenders and 2 pair of underware approach. Pocket holes are created by a very simple and inexpensive jig. The most common one is from kreg. If you are building a boat, trust me you're gonna get in to woodworking and you will use the kreg jig often. I was also thinking of using my Kreg jig for pocket holes. It define would add strength during construction, but, also prevent twisting. I doubt that boat building professionals would recommend the use of steel screws in a boat hull, even coated steel screws from Kreg. Only bronze will remain corrosion-free in a wood boat hull, according to research I did prior to boat building. Bill I agree with you but again I am not relying on the pocket screws for strength. The epoxy and gussets will still be installed with bronze screws/nails. The pocket screws were in my case purely for alignment purposes and to hold the joint together until the epoxy cured. I would not recommend pocket screws and epoxy only for exactly the reasons you listed. The strength of the joint comes from the epoxy, as with all wood adhesives, the glue is stronger than the fibers of the wood. The gussets provide stiffness to prevent the joint from racking and breaking those wood fibers. Not sure, cuz I don't own one yet, but I would think that the fixture could be used to drill the pilot hole and silicon bronze screws could be used. And you are very correct in using the gussets to re-inforce the joints. A less expensive way would be to lay out the frames on a work table that you can nail into. Use small finishing nails to hold the pieces in alignment and then glue and nail the gussets in place using ring shank bronze nails. After the epoxy has set up, the frame can be pulled off the nails and the other side gusset installed. I oversized the gussets and sanded flush to the frame once completed. Here are some pics of laying the framing out, gluing and nailing, and the finished frames cleaned up. If you need to cover a finishing nail with a gusset, the nail head will pull through once the epoxy is cured and you lift the frame off the table. Plugging away with 27 hours in. Building frames, cutting parts from 3/4 okoume plywood, epoxying and screwing together, flush cutting with router for alignment. All I have left is to cut the transom. I bought all the lumber for the building frame and hope to have that up tomorrow. With a little luck everything with be on the frames and ready for some battens and chine bending. Nothing worth photographing but I did have a good week at work. Got to captain one of our 29 foot safe boats on Lake Ontario, not my normal assignment but I'm not turning down the chance to get paid to work on the water!